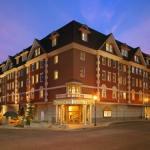 Offering a restaurant and a fitness centre Portland Harbor Hotel is located near the Portland Waterfront. Free WiFi access is available in this luxury hotel. Old Orchard Beach is just 16 km away. A flat-screen TVs are included in every guestroom at the Harbor Hotel of Portland. A refrigerator and desk are included for convenience as well. Select rooms include a sofa spa bath and a view. At Portland Harbor Hotel you will find free bikes. Other facilities offered at the property include meeting facilities luggage storage and dry cleaning. The boasts a private garage with valet parking. The hotel is 400 metres from Wadsworth Longfellow House 500 metres from Portland Downtown Historic District and 600 metres from Victoria Mansion. Portland International Jetport Airport is 4 km away.